Leading Age Services Australia (LASA), the voice of aged care, has welcomed a boost to Short Term Restorative Care Places, announced today by Senior Australians and Aged Care Minister Ken Wyatt. The Minister says the $58 million annual funding boost means the number of older Australians receiving restorative care each year will almost triple – from 3,088 to 8,125 – with expanded programs increasing care places from 475 to 1,250. 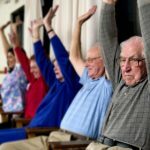 LASA Chief Executive Officer Sean Rooney says the program will assist older Australians to maintain their independence by providing tailored care plans focused on re-ablement strategies such as strengthening exercises, physiotherapy and occupational therapy, along with home and furniture modifications. “Any move that supports older Australians to receive the care that best meets their specific needs is welcome. “As the Baby Boomer generation moves into retirement there is a growing demand and expectation in the community that older people will have genuine choice about ageing well, and that this choice will be supported. “These programs will support older Australians who choose to live at home to maintain the activities that provide meaning to their lives. “However, this announcement is only one step and the Government must do more to ensure older Australians are getting the care they need. “Providing levels of funding that truly reflect the increasing costs and growing demand for age services is the only way we can guarantee the growing and changing needs of older Australians in all types of care settings are met.